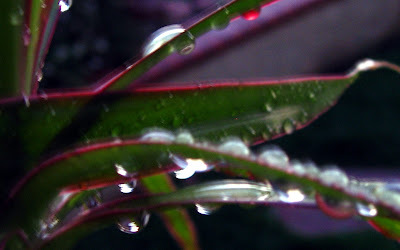 Raindrops on the leaves of a plant, on my patio. We had rain, with more expected. Macro Monday is the brain-child of one of my fave photographers, Lisa. 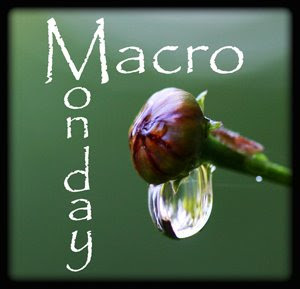 Macro Monday is easy to play, snap a macro (or close-up) photo, post it on your blog, and let Lisa know you're playing. We're having rain too, but only for a short while. At least it bring some respite from the hot and humid day we have here. Rain's a good thing, right? Rain,,, we want rain.... We dont want a water restriction on our place .... So rain is good!!!! Rain? Not snow? 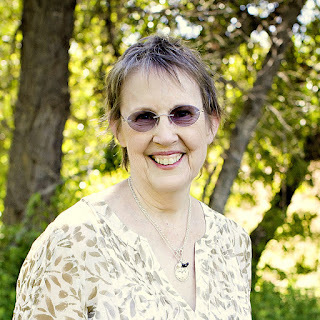 You and I are among the lucky! The red edge is so cool! Although I hate rain ( I probably have told you this before)I know it makes wonderful pictures, and stunning macro's like this one!